VSECU is committed to helping members make smart investments in their homes and communities. 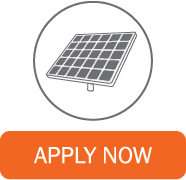 We’ve teamed up with Peck Solar to offer VGreen financing to maximize your solar investment savings. Contact the Peck Solar team to get started. Designed to finance larger solar purchases, the unsecured VGreen 20-Year Energy Improvement Loan has discounted fixed rates and an extended term. You’ll benefit from an investment that reduces your home’s operating expenses and provides consistent monthly loan payments.